What are the server requirements to use Appointment Buddy Plugin? 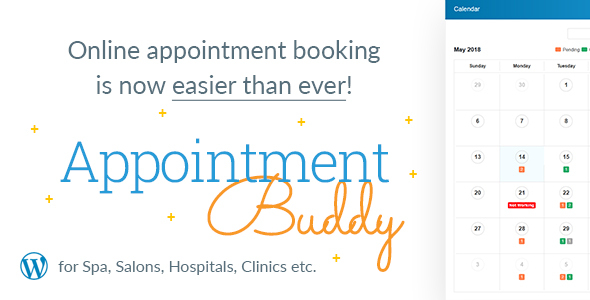 What are the system requirements to use Appointment Buddy Plugin? Ideal For: Spa & Salons, Clinics, Laywers, etc. Payment Gateways: Stripe & PayPal Supported. Everything Is Easy: Find an easy way to manage your appointments in most organized way. Fully Responsive: Mobile friendly design for users and administrators. So work from anywhere, anytime. Offline Payment: Enable your customers to book and pay after service if they don’t want to pay upfront with credit card or paypal. 2 Way Google Calendar Synchronization: Easy to synchronize staff member canlendar with appointment buddy. Email Notification: Build-In email notification for appointment booking, cancallation, visited, etc. Unlimited Staff Management: Create / Delete unlimited staff members. Unlimited Service Management: Create / Update / Delete unlimited services. Unlimited Timeslot Management: Create / Update / Delete unlimited time slots. Holiday Management: Create / Delete unlimited daysoff. Calendar: View pending, completed and cancelled appointment count per month. Powerful Admin Panel: Control almost everything with advance configuration fetaures. CSV & PDF files: Export all list in CSV and PDF format. Customer Data: Get all insights about your customer data. Friendly Support: Get resolution of everything as our team is always ready to help you for everything.